Long Island has already experienced a number of bitter cold days and knowing that February can be the coldest month of the winter season, United Way of Long Island in partnership with community and corporate partners held Project Warmth Day at the Rosa Parks Hempstead Transit Center/NICE Bus. As Long Island’s only islandwide non-governmental emergency heating fund, Project Warmth is available all winter as a safety net for individuals and families who are facing energy insecurity, many of whom have already exhausted all other options for assistance by this point in the season. Customers and transit center visitors connected with United Way of Long Island’s Project Warmth community partner agency representatives who were on-hand to give the residents immediate counseling on how to access the emergency fuel fund to help them pay their home heating bills. This included Hempstead Works, Community Empowerment Resource Center (CERC), Choice for All, Long Island Council of Churches and EAC, as well as Project Warmth’s leading corporate supporters, National Grid Foundation, National Grid and PSEG Long Island. Eligible applicants include residents who are behind in their utility payments, have a low or empty oil tank, have received a disconnection notice, and/or can demonstrate financial hardship. This is especially critical for seniors, veterans, families with young children and people with disabilities. Project Warmth is also available to federal government workers and others affected by the partial-government shutdown who are still recouping from missed paychecks. There are 302,988 households on Long Island who struggle to make ends meet, known as ALICE (Asset Limited, Income Constrained, Employed). These families and individuals work hard to make enough money to support their families, but often find themselves behind on bills. This time of year is especially dangerous for this population during the winter months – their situation could quickly become perilous. Project Warmth is made possible through the generous support of individuals, corporations and foundations. This includes leading sponsors: National Grid Foundation, National Grid, Northville, PSEG Long Island, and Oil Heat Institute. Since its inception in 1994, Project Warmth has provided more than $10 million in emergency funding to more than 94,000 children and adults. To support Project Warmth, please make a contribution on United Way of Long Island’s website at www.unitedwayli.org/projectwarmth. For assistance from Project Warmth, contact United Way of Long Island's 2-1-1 service by dialing 2-1-1, calling toll-free at 1-888-774-7633, or visiting their website at www.211longisland.org. To support Project Warmth, please make a contribution on United Way of Long Island’s website at www.unitedwayli.org/projectwarmth. 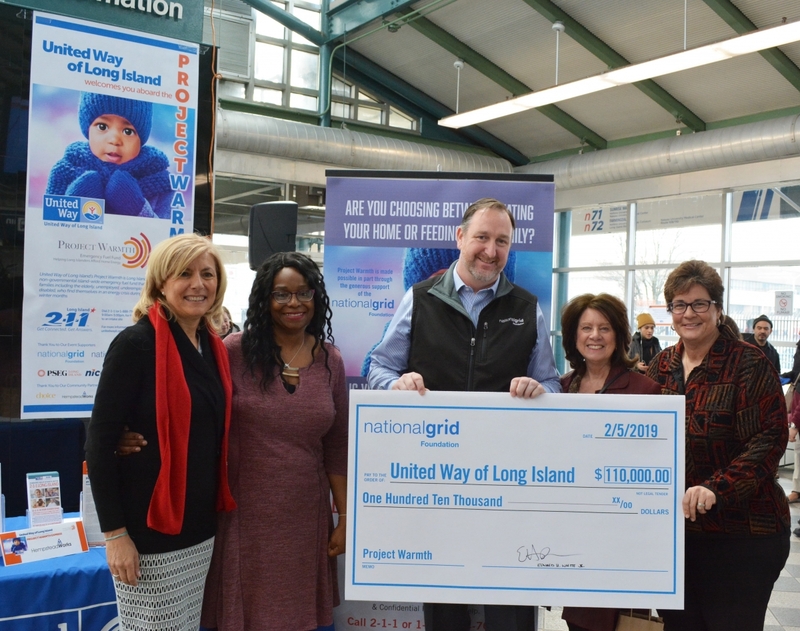 Photo Caption: National Grid Foundations presents a check for $110,000 in support of United Way of Long Island’s Project Warmth emergency heating assistance program. Pictured from left to right: Nina Fenton, Chief Development Officer, United Way of Long Island; Meshessna, Project Warmth recipient; Edward White Jr., Executive Director, National Grid Foundation; Eileen Cohen, Chairperson of the Board, National Grid Foundation; Theresa A. Regnante, President & CEO, United Way of Long Island. National Grid Foundation was created to enhance the quality of life across its grant making territory. The Foundation’s ongoing challenge is to create opportunities for solutions to educational and environmental issues. Its objective is based on the principle that giving people the tools to build hope is an essential ingredient in the development of individuals, families and communities. Since its inception in December of 1998, the Foundation now in its 20th year has granted nearly $25 million to local community organizations.